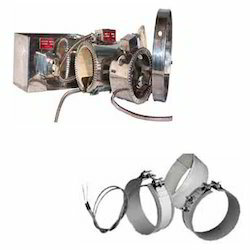 Offering you a complete choice of products which include power saving heater, band heaters, mica band heater, air-cooled ceramic band heater, ceramic band heaters and mica band heaters. We offer the Power Saving Heater to our client. The standard ceramic insulated band has been, and continues to be the only barrel heater having built-in thermal insulation. In what went before, machine manufacturers have chosen to use the heater because of several advantages, but infrequently for its heat conserving qualities. The existing energy situation (in which the plastic processor must bare the inflated costs) is the reason for the development of the “INSULATION TECH” Power saving heater. MATRUSREE’s “INSULATION TECH” power Saving Heaters are Specifically designed and engineered to meet the ever increasing demand for energy conservation and to improve operation efficiency capable of generating higher temperature essential to process today's high temperature resins. "Maximum Energy Savings, Minimum Sheath Temperatures"
Matrusree designs & manufactures variety of Band Heaters, That are most commonly used in the plastic injection molding and extrusion processes machines. Use as low a watt density rating as your application permits. A close match of the heat supplied to the actual requirements will reduce temperature overshoot, reduce cycling and increase the life of any band heater you use. 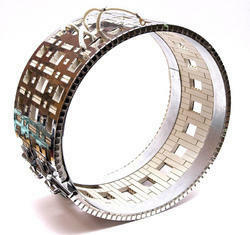 Matrusree’s mica band is a proven heater design for good life efficiency and dependability. It assures maintaining the lowest winding temperatures possible, keeping a low-mass heating element assembly for fast heat-up and quick response to controls. A specific, nichrome or kanthal ribbon wire is wound on specially selected mica grade providing even heat distribution for maximum heater life. Mica of proper thickness is then used to insulate the windings that provide excellent thermal conductivity and dielectric strength .The element pad is now enclosed in a specially treated rust-resistant steel sheath casing that provides the best combination of physical strength, high emissivity and good thermal conductivity to heated cylindrical parts. 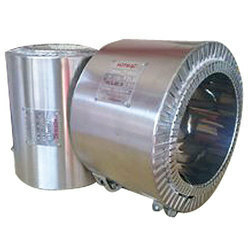 Mica Band Heaters is a proven heater design for good life efficiency and dependability. It assures maintaining the lowest winding temperatures possible, keeping a low-mass heating element assembly for fast heat-up and quick response to controls. These are provided to our customers as per their specifications. Highest quality mica used for excellent dielectric strength in all designs. Thin construction for maximum heat transfer. All bands are accurately rolled to the specified diameter for optimum contact. Air-Cooled Ceramic Band Heater are combined with high velocity fans to form fast responding heat / cool units in accurate heating applications. These heaters are made with a perforated outside stainless steel sheath, and with no insulating jacket. Specifically designed for the blower air cooling process/applications on extrusion machineries. 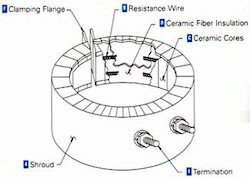 Ceramic Band Heaters are medium-to-high temperature heaters that have 650ºC as a maximum working temperature. These durable heaters have in-built ceramic fiber jackets that make them energy efficient. Ceramic band heaters are available with different terminal styles, are fully flexible, and can accommodate holes and cut-outs. Maximum Width: Dependent upon the ratio of diameter to width. 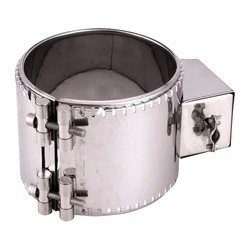 Mica Band heaters are available with energy saving options in various sheathing materials, such as Aluminized Steel, Chrome Nickel Steel, Brass depending upon applications which provides the best combination of physical strength, high emissivity & good thermal conductivity to heat cylindrical parts, good for sheath temperature upto 300°C. MATRUSREE’s Cast Band Heaters have proven to be the most effective method for heating and cooling the barrels of plastics processing extruders. They are extremely efficient, providing thousands of hours of dependable, trouble free service. Specifically for close contact heating enabling precise heat conduction. 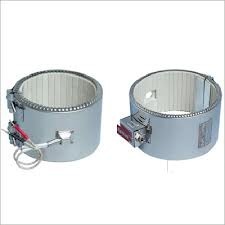 Cast Aluminum heaters are machined to fine limits and complex patterns are achieved. They can be produced to your specifications or drawings, alternatively, against your sample. MATRUSREE offers CAST-IN band heaters with liquid and/or air-cooling functions. Liquid cooling incorporates tubing formed to a specific shape and casted as part of the heater assembly creating a passage for processing water or heat transfer solutions to dissipate the heat. Air-cooling incorporates numerous fins casted to the O.D. surface of the band. Habitually, liquid cooled Cast-In Heaters have been the more frequently employed method of controlling the melt temperature of extrusion barrels. There is no doubt about the effectiveness and speed of liquid cooled castings in removing heat from the extrusion process. Air Cooled Cast-In Heaters are virtually maintenance free and therefore, when properly installed and applied, have the capability to far outlast their liquid cooled counterparts. Since cooling tubes are not used, the possibility of breakage, cracking or becoming clogged with brine or mineral deposits is not a concern. Additionally, Air Cooled Cast-In Heaters do not require an expensive cooling tower or heat exchange system, extensive plumbing systems and labor for installation. These factors along with the benefit of being maintenance free make MATRUSREE’s Air Cooled Cast-In Heaters an economical and practical source for your extrusion heating and cooling application. In certain instances where air-cooling alone will not sufficiently cool the process, liquid cooling tubes can be cast into the heater as well to maximize BTU removal. Looking for Band Heaters ?